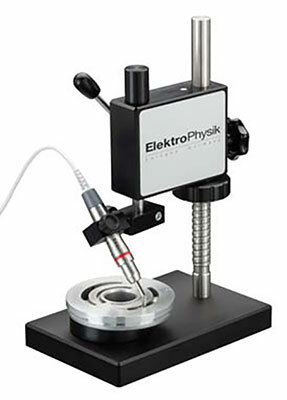 The intelligent solution for coating thickness measurement. Memories can be partitioned as needed. Calibration Modes: Factory calibration, zero-point-, 2-point-, 3-point-calibration, calibration method "rough"
Standards: ISO, SSPC, "Swedish", "Australian"
Typical applications: non-magnetic coatings such as paint, varnish, enamel, chrome and galvanizing on steel substrates or insulating coatings such as paint, anodized layers or ceramic on non-ferrous substrates such as copper, aluminium, die cast zinc, brass etc. The new MiniTest 725 - 735 - 745 series sets new standards in precision and flexibility. All models of the new series are equipped with a Bluetooth interface for wireless data transfer to a PC, Tablet-PC or smartphone. As an alternative, data transfer can also be made via a conventional USB connection. Further data processing on the end device can be done via a comprehensive evaluation software, MSoft 7 professional, or the mobile app. For an IT based quality management, the connection to a CAQ software such as the QUIPSY® software are available. MiniTest 725 with a built-in sensor is especially suited for quick measurement on car bodies, hulls or steel constructions. Thanks to its ergonomic design for one-handed operation all functions can be easily accessed with one hand only. 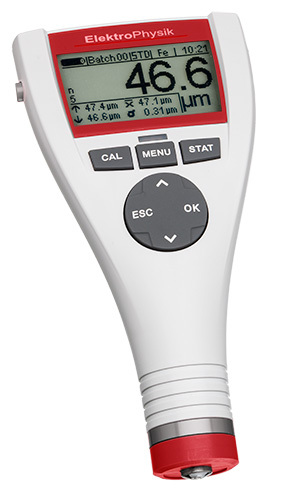 MiniTest 735 with an external sensor combines high precision and ease of measurement. The cable-connected sensor ensures convenient measurement on objects difficult to access. MiniTest 745 - the top model of the series - convinces through its flexible sensor design. Its built-in sensor can be easily converted into an external sensor. Thus you can take advantage of the features of both sensor designs. Additional comfort and flexibility is provided by the wireless sensor. Flexibility and mobility through wireless sensors - Take full advantage of today's innovative and flexible connectivity options by using the wireless MiniTest 745 sensors. Just connect your digital sensor to the Bluetooth Smart-adapter and your readings will be transferred immediately to the MiniTest 745 gauge - in a distance of up to a 10 m. All MiniTest 745 sensors are Bluetooth Smart-adapter capable. Advanced precision through digital signal processing SIDSP® - All models of the MiniTest 725 - 735 - 745 series connect to SIDSP®-sensors. Thanks to the use of the most advanced SIDSP®-technology, these sensors are unsusceptible to interference and provide an excellent measuring accuracy. Even variations in temperature will not affect measurement and readings remain stable to ensure a very good reproducibility over the complete measuring range.